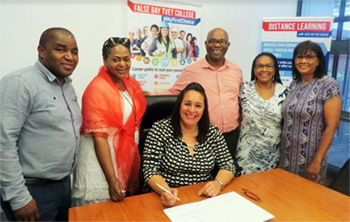 False Bay TVET College signed a Memorandum of Understanding (MOU) with the Department of Social Development, to increase the number of student placement opportunities and bolster further and higher learning opportunities for unemployed youth. Representatives from the Department of Social Development, Ms Nomvume Ralarala, and Mr Mnikelo Mqikela presented the signed MOU at the False Bay TVET College Central Office. The agreement, which routed from an introductory meeting some two years ago has now formalized. Founded on the collaboration, which combines teaching, sharing of training information, supporting Entrepreneurship initiatives and strengthening efforts geared towards Work Integrated Learning, the agreement will increase the sphere of opportunities all round. The White Paper (DHET, 2014e) recognises the importance of partnerships between educational institutions and employers and the use of resources of both the private and public sector drivers in deepening and transforming the entire post-schooling system. The White Paper allows the DHET to contribute more effectively to the goal of inclusive economic growth and development, and to contribute fundamentally in reducing unemployment and poverty in line with the National Development Plan. In the exchange Mr Mnikelo revealed that even before the formalisation of the MOU, he has been an advocate for the College and shared numerous higher education opportunities to the youth and communities serviced by the local social development offices. The False Bay TVET College curriculum is informed by the scarce skills and economic drivers in the Western Cape, South Africa. However, it’s not enough just to deliver the programme, but fundamental that all students complete the practical aspect of training through adequate Work Based Exposure Learnings. Acting Principal for False Bay TVET College, Ms Karin Hendricks said “this agreement will provide greater access to the youth to advance in their life journey.